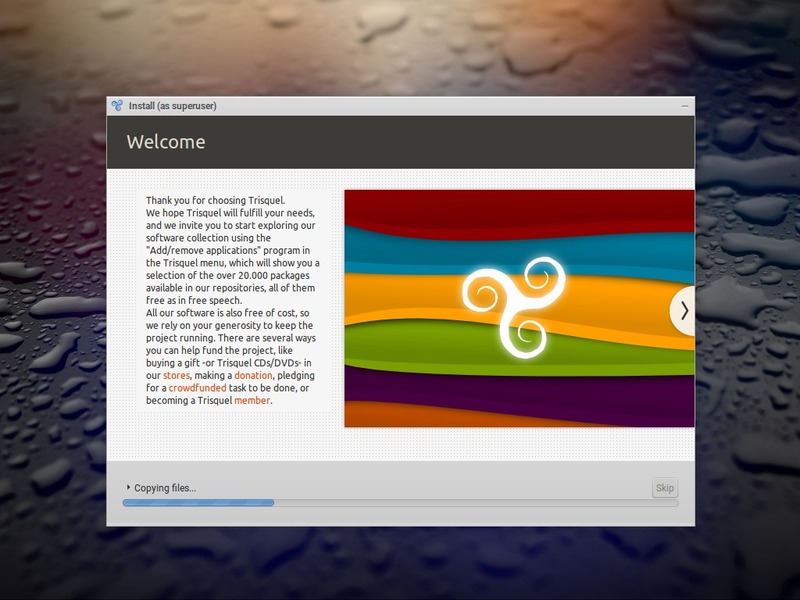 Trisquel 8.0 LTS Flidas | Trisquel GNU/Linux - Run free! Trisquel 8.0, codename "Flidas" is finally here! This release will be supported with security updates until April 2021. The first thing to acknowledge is that this arrival has been severely delayed, to the point where the next upstream release (Ubuntu 18.04 LTS) will soon be published. The good news is that the development of Trisquel 9.0 will start right away, and it should come out closer to the usual release schedule of "6 months after upstream release". But this is not to say that we shouldn't be excited about Trisquel 8.0, quite the contrary! It comes with many improvements over Trisquel 7.0, and its core components (kernel, graphics drivers, web browser and e-mail client) are fully up to date and will receive continuous upgrades during Flidas' lifetime. 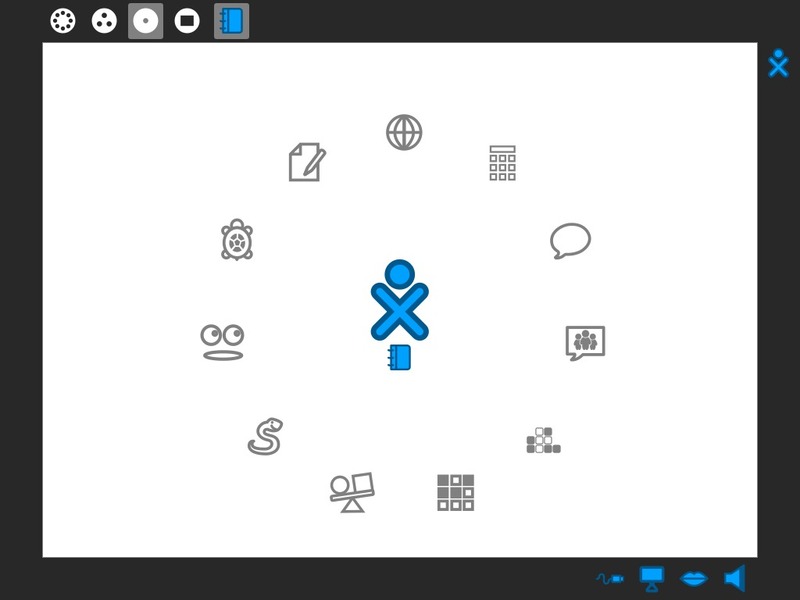 Trisquel 8.0 has benefited from extensive testing, as many people have been using the development versions as their main operating system for some time. On top of that, the Free Software Foundation has been using it to run the Libreplanet conference since last year, and it has been powering all of its new server infrastructure as well! 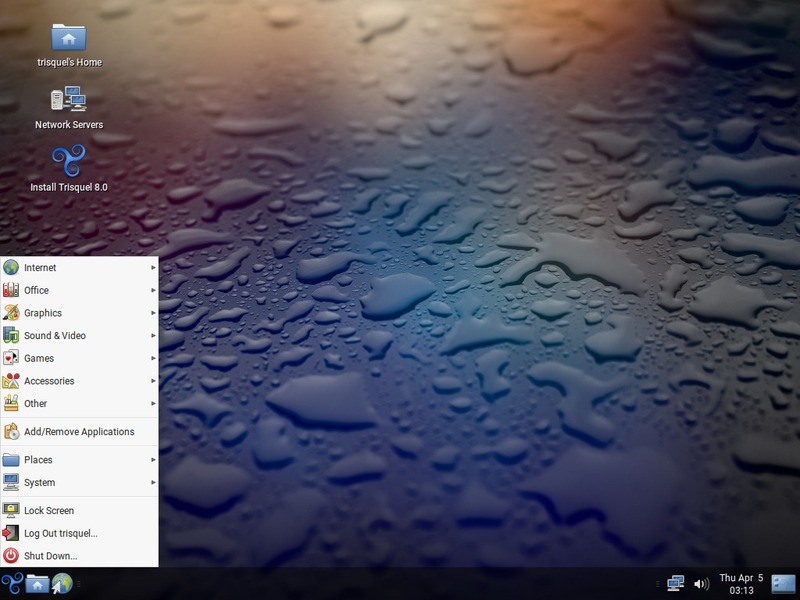 The biggest internal change to the default edition is the switch from GNOME to MATE 1.12. The main reason for this change was that GNOME dropped support for their legacy desktop, which retained the GNOME 2.x user experience and didn't require 3D composition -- a feature that in many computers would still need non-free software to run at full speed. MATE provides a perfect drop-in replacement, it is very light and stable and it retains all the user experience design that we are used to from previous Trisquel releases. The next most important component is Abrowser 59 (based on Mozilla Firefox), which is not only fully-featured and quite faster than before, it has also been audited and tweaked to maximize the user's privacy without compromising on usability. Abrowser will not start any network connections on its own (most popular web browsers connect for extension updates, telemetry, geolocation and other data-collection as soon as you open them, even if you haven't even typed an address yet!) 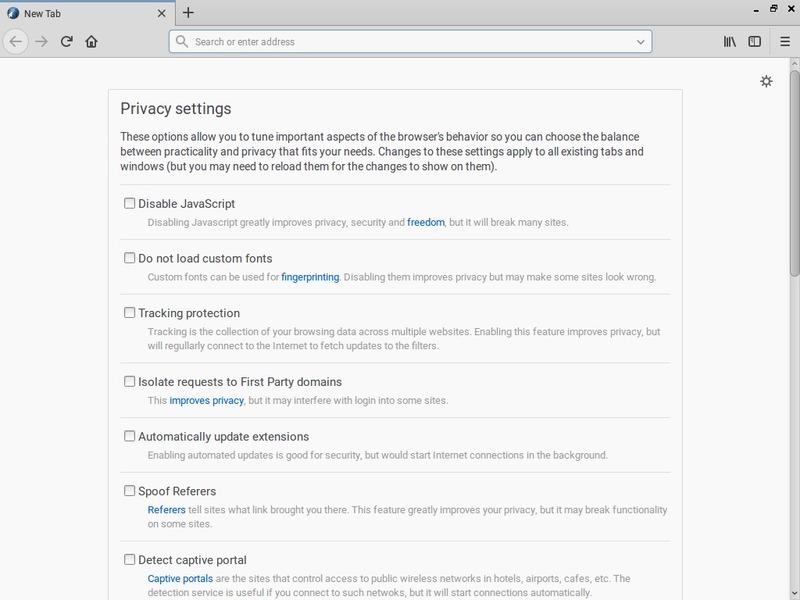 and it has a list of easy to set, privacy-enhancing settings that the user can opt-in depending on their needs. As a companion to it, and based on Mozilla Thunderbird, the IceDove mail client is also fully updated and set up for privacy. 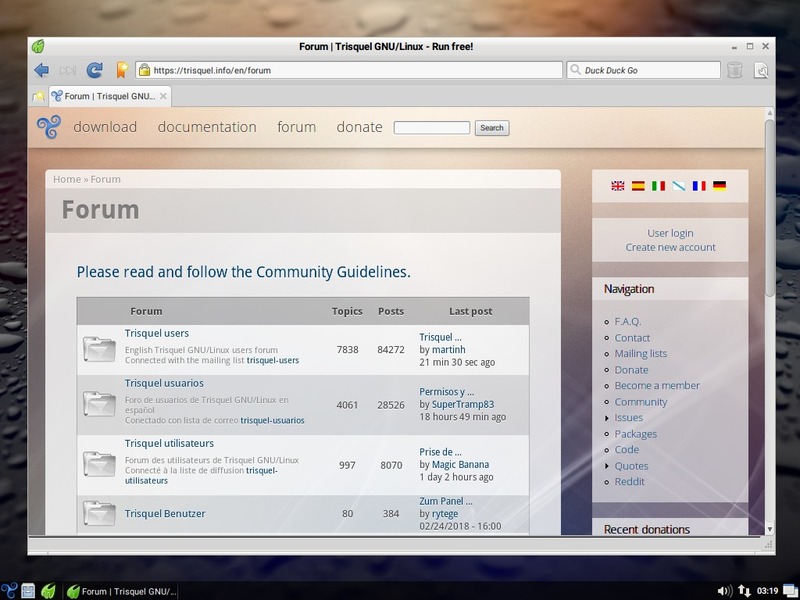 Trisquel-mini (the light edition based on LXDE) uses the Midori web browser, Sylpheed email client, Abiword text editor, and GNOME-Mplayer media player as its main preinstalled components. We also have the Trisquel TOAST edition, based on the Sugar learning environment v112, and complete with a selection of educational activities for k12 and beyond. And of course, available from our repositories and mirrors are over 25,000 more free software packages you can run, study, improve and share. Trisquel is a non-profit project, you can contribute by becoming a member, donating or buying from our store.